Is it possible to drive a 4x4 RGB common-cathode LED matrix with a MAX7219? 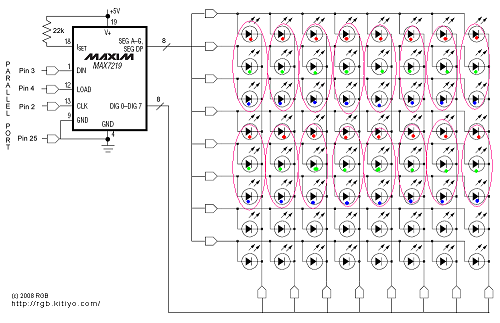 The MAX7219 (datasheet) is a LED matrix driver that's designed to drive an 8X8 single-colour LED array. tronixstuff has an intro on how to use it with an arduino that has some relevant diagrams. I'm wondering if it's possible to use the chip to drive a 4x4 common-cathode RGB LED matrix? This is effectively 3/4 of the intended matrix, so if it weren't for the common cathode aspect, it would be easy. But the chip only has 8 in and 8 outs, so it would not work to treat it that way, because all three 4x4 matrices share only 4 cathodes, so there will be interference. So I'm trying to figure out if it's possible to get around this problem in a not-too-painful way, perhaps using some kind of charlieplexing scheme. Or should I just give up and go back to 74HC595Ns? But still, there would be a problem with different perceived intensity for different colours. You didn't provide a link to the MAX7219 datasheet, so I can't say for sure. However, from your description it sounds like this chip has 8 anode and 8 cathode driver lines. If so, it can handle groups of up to 8 LEDs with cathodes connected. You have 16 groups of 3 LEDs, with the cathodes connected in each group. One cathode driver line from your chip can handle two such groups, and you can have 8 of those, for a total of 16 groups. So yes, it should be possible. Of course you'll have to consider how the individual color LEDs are arranged within the overall 8x8 matrix and convert from your (X, Y, color) address to the chips (X, Y) address. Another issue (again, need datasheet to know) is whether the chip can tolerate different forward voltages per LED, or different within a row or column, and what maximum voltage per LED it can drive. You may be able to compensate for the different voltage of the red, green, and blue LEDs with different series resistors, depending on whether the chip drives with current or voltage. See the datasheet for details. Not the answer you're looking for? Browse other questions tagged multiplexer 74hc595 led-matrix charlieplexing or ask your own question. How to control a common-cathode RGB LED matrix with Arduino? Where do the RGB LED matrix resistors go? 8x8 RGB LED PWM matrix with TLC5947 which IC to use on the cathode end? Can two MAX7219 chips drive a 10x11 LED matrix? Is it Possible to control LED with arudino pins combined with PWM from IC?